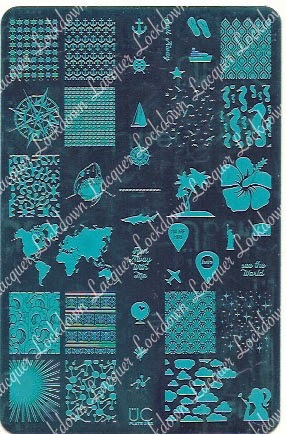 Lacquer Lockdown: UberChic Beauty Nail Art Stamping Plates Review! 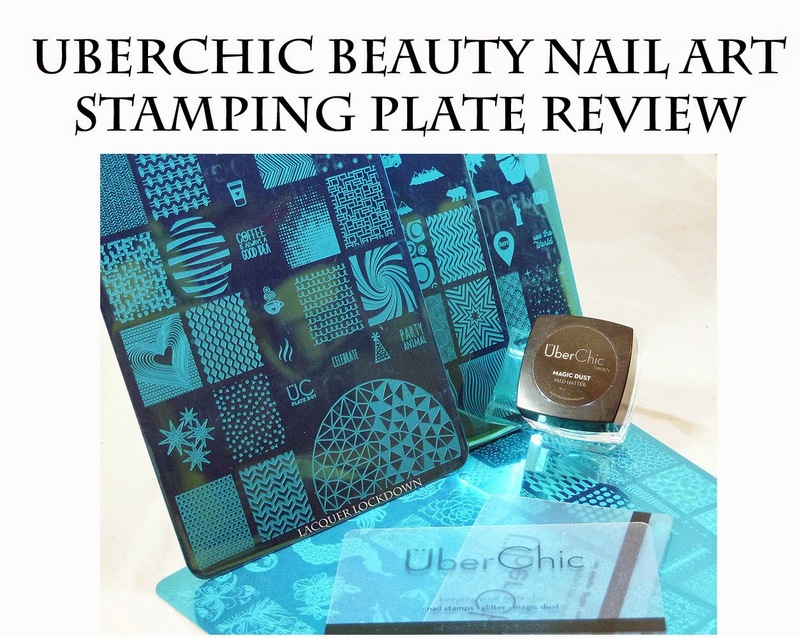 UberChic Beauty Nail Art Stamping Plates Review! I'm back with yet another all out epic full blown stamping plate review! I know I promised this review ages ago and I would have posted it, but I was holding out for some news that I think will make most of you happy ;) . Today I'm going to turn my attention to a brand that created a lot of rumblings and excitement on this blog. 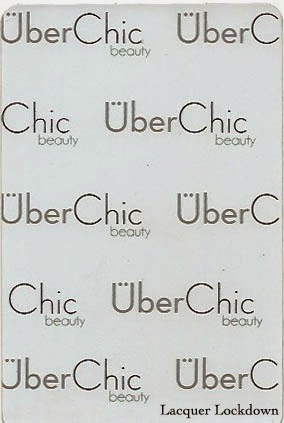 That's right let's talk about UberChic Beauty and their new nail art stamping plates! As usual with these reviews each portion is broken up into segments so feel free to scan through, but don't forget to leave feedback and comments as they are not only important to me but keep the blog going! All right lets get started..
Just as a quick refresher though by the number of hits on the blog I know most of you have seen my original UberChic post. Lol. In any case UberChic Beauty was created by the lovely Brittany Hull. 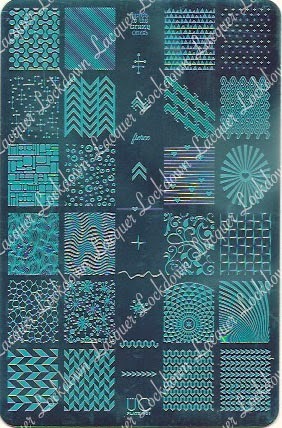 She worked like mad over this last year to create this US based brand of stamping plates that resonate with all artistic vision she had in mind along with the design to meet the needs of the stamping community. The image size on these plates can vary generally they are 2.0 x 1.7 cm length by width but they can and do get larger. These days it's a bit of a breeze for me to show you comparisons of different image sizes across brands since I made my large chart. For now I'll mention my common brands as a point of comparison, but if you are interested in a broader comparison across many brands you can click here to view a comprehensive chart I created with measurements from most brands of stamping plates. Also I have recently added some new measurements to the chart so be sure to check it out! As with all my reviews when swatching out the images I used Wet N' Wild Black Creme and my gold standard XL marshmallow stamper from Bunny Nails (4 years old) or as in this case my marshmallow stamper from Magno Nails. 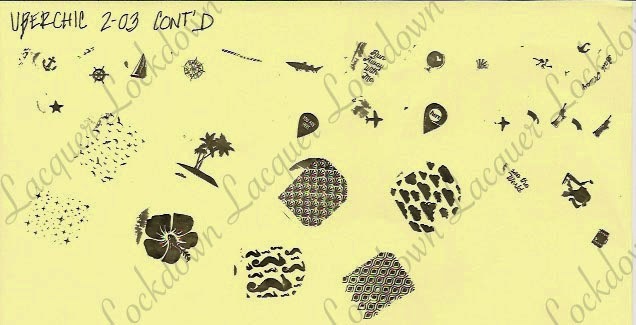 I chose the Magno Nails stamper because several of the images were quite large and I wanted to be able to capture them with ease. 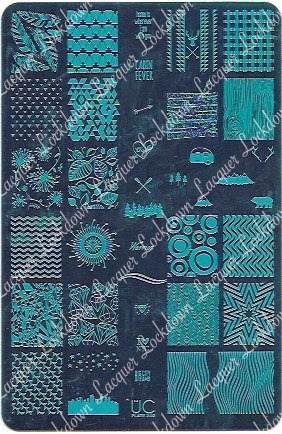 I will switch to Konad Special Stamping polish or Mundo de Unas only in the event I am unable to pick up an image which I didn't have to do with any of these images. Again for those that don't know the reason I choose to stamp with Wet N' Wild Black Creme for my swatches is because it's cheap and readily available. Furthermore, it is the lowest quality polish I can use for stamping. What does that mean? It means I don't expect images generated by WnW to have near the clarity of those generated using a polish designated for stamping. Stamping polishes allow an image to stamp with even more clarity and crispness than regular polish. Period. 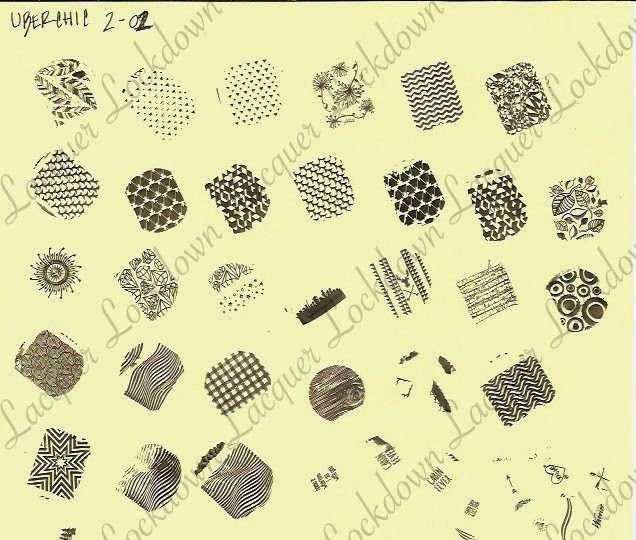 In short if I have a plate that stamps well with WnW polish this is my assurance that indeed the etching on these plates is excellent enough that it can support stamping with a polish that is not meant for that purpose. 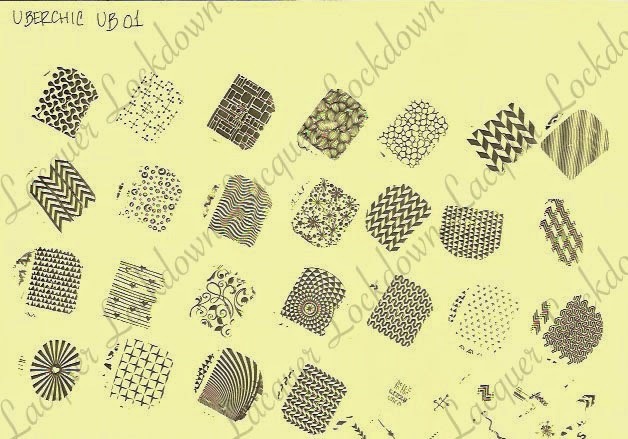 As usual these days I choose a few of the more intricate patterns from some of the UC plates and swatched them out with various polishes. 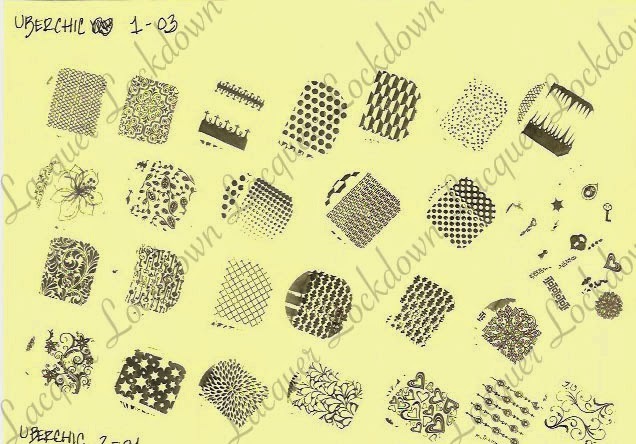 Some of these polishes were purchases specifically with the task of stamping in mind and others are just regular polishes that I have found stamp well in the past. 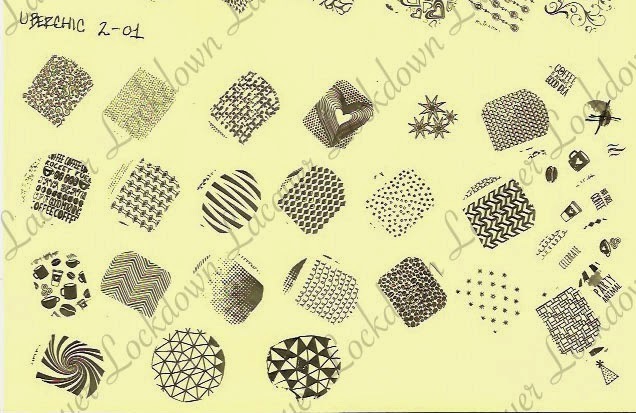 This section is basically just a let's see how well x brand of plates stamps across many different kind of polishes. After all we all own a few of those plates that just won't stamp well unless they are used with stamping polishes only. 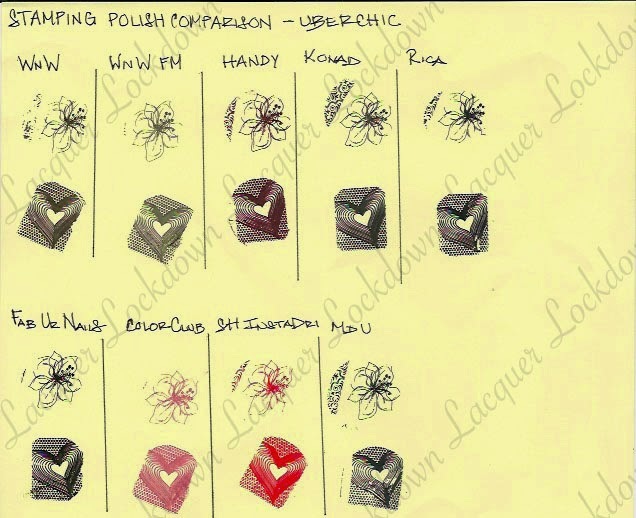 Ok so let's see how the UC plates swatch out across different brands of stamping polish! 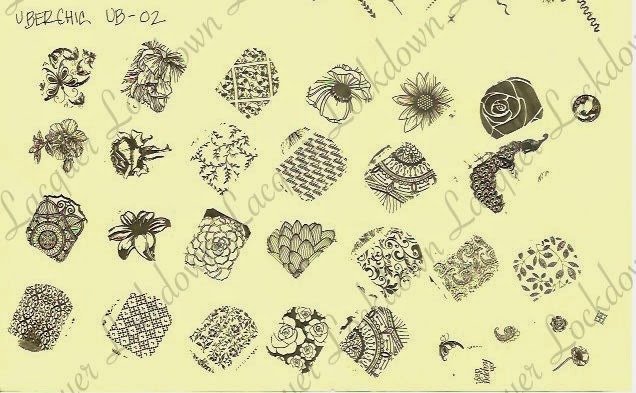 I think the singular flower I chose here is the most finely etched image across any of these 6 plates. So fine in fact that it really does not stamp well with polishes not designated for stamping, i.e. Wet N Wild, or faster drying polishes, i.e. Rica. 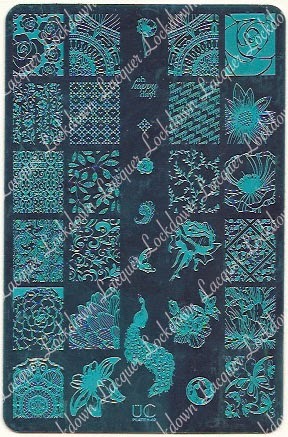 But when used with stamping polish it stamps beautifully. What impressed me even more so however was that every little detail of this flower picked up so perfectly despite being so finely etched! These plates are wonderful! Which I knew they would be well before they arrived on my doorstep. After all Brittany spent the time carefully researching and crafting her brand well before its launch to ensure it was just that. You can see the level of care and dedication she put into everything from the careful branding to the precision of etching. You know I firmly believe in supporting these indie brands and moreso empowering women to go after their dreams! I'm fully impressed and excited to see more of what UberChic has in store for us. Now to address a few issues outstanding. Something has been bothering me since I put up my post announcing the UberChic plates. I noticed several comments related to the pricing of the plates being expensive or that they wanted the plates unbundled. The latter comment is reasonable because not everyone wants every plate in the world, that's just me lol, but the former is plain laughable. Let me explain why. The UC plates are the same size as MyOnline Shop and FUN plates, both of which retail around $16-18USD, and contain roughly the same number of images as the MOS and FUN plates. UC plates contain 24 full-sized nail images vs 25 on the other two brands. The UC plates also contain around the same number of smaller accent images. However in a bundle UC plates cost $24.99USD for 3 plates. If you do that math that's roughly $8.33USD per plate for a plate containing the same number of images as the FUN and MOS plates. Even if they were to be split up and sold individually at $12 a piece, rough estimate from Brittany, they still would be less expensive than similar sized brands on the markets. The reason I took the time to break this down for you isn't that I wanted to say one brand is better than the other. You know damn well I can't live without my FUN plates, rather I wanted to say don't let the bundled price tag fool you. These plates are a bargain and are worth the investment! I know many ladies especially in the international community were quiet frustrated with the price of shipping on these plates. So here's some good news. UberChic has moved its shipping to a service dedicated to that task which means the price of shipping has dropped domestically from $5.99USD to $5 and internationally from $15USD to $10USD. While that might not seem like a lot every little bit counts right? Especially when we all love and adore buying stamping plates. So I'm going to leave it here for now. 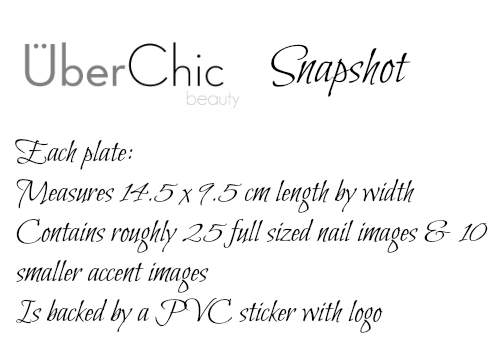 You can found UberChic Beauty products on the UberChic website. These bundles retail for $24.99 USD + the aforementioned shipping. You can also find the UberChic Magic Dust and scraper set there as well! I hope this was helpful for you guys and stay tuned for some upcoming nail art and gasp a tutorial! Please don't forget to leave feedback, questions or comments and happy hunting! This post contains products sent for my honest review along with products purchased by myself. For more information please see my Policies. 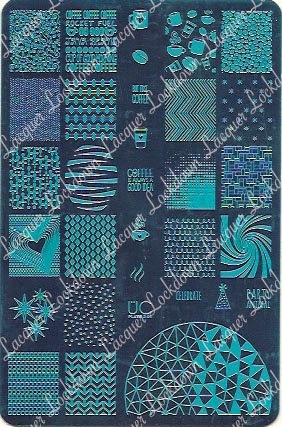 How well do these images fit on your nails? They were wide enough for mine but the drop in length from MoYou XL was very notable for me, I need those extra millimetres. Also, I only revived a small Baggie of magic dust, not the jar that I've seen bloggers show on their review posts. In honesty I was disappointed but this purchase especially now the shipping cost has been reduced. That said, the image quality is good. A small baggie! How disappointing indeed! I'm sorry that happened but I'm glad you share that info. I LOVE these plates! I saw you mention them not too long ago and bought them IMMEDIATELY because I absolutely had to have them. Even the plates that aren't in my typical subject area (i.e. camping, hipster, etc.) are things that I could see myself doing sometime just for the heck of it, or at least for my friends for sure. One bummer was that when I got my plates in the mail, one of them had been cut crooked, so a few of the images were cut off on the side. I emailed customer service about it (there was a handy dandy email address on the shipping note) and within a couple hours had a response from Brittany or someone handling issues for her, and she offered to send out a replacement. This was on a Sunday! Incredible. Fantastic customer service. I'm very impressed with everything about this company and will keep a close eye out for new releases. The own stated that it would be a sample on the website and not the full sized jar. I can certainly see though how a baggie would be disappointing if you were expecting a jar, but even I was surprised when I got the jars! Lol I had to have them both. For me there were images I wanted across both sets and I knew I'd be disappointed if I chose just one. They are wonderful aren't they! I'm so happy to hear that you had a great customer service experience since I know that is so important to Brittany. I know she was thrilled to pieces when I shared her comment with you and I know from my own vantage just how important it is to have a company send you quality products when you've spent your hard earned dime. Fun I'm sure you're going to love them when they arrive! Lol and how would you know how many plates I own wink wink? About the basics thats why I always tell people if you are a going to pick out plates to start your collection basics are the way to go because otherwise you're going to be left with OOK which while nice aren't as easy to use over and over again in different ways. Hi, I got the collection 02 but I can't seem to get the big world map to stamp - can you share tips on how I can make it work? I just found this review, it's extremely helpful! My two sets just arrived in town today so I should have them today or tomorrow. I was excited before, but even more now! If I hadn't already decided to buy them, this review would have convinced me. Thank you, reading this has been quite reassuring, as being a Canadian these two sets ran me about $80CDN with the horrible exchange rate. It's nice to know the money will have been well spent! 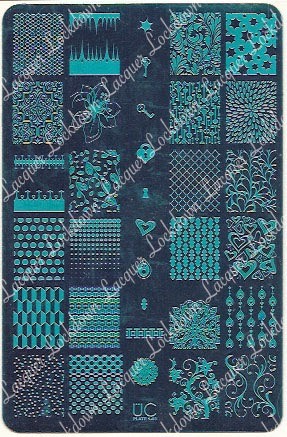 I have the Pueen SE encore set and 4 MoYou plates (3 pro xl and one princess) plus a creative shop stamper. I'm brand new to stamping, but I knew if i didn't get the 'good stuff' first thing I'd get frustrated and gone up on it forever.